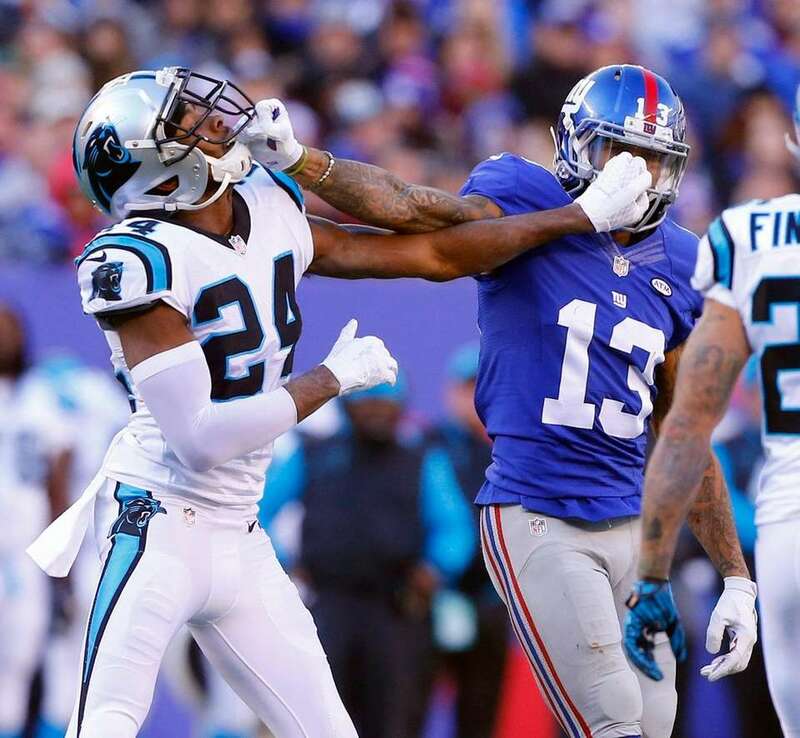 Scenes from Sunday's Giants-Panthers game where Odell Beckham Jr. and Josh Norman got into several scraps on the field in NFL Week 15. Josh Norman #24 of the Carolina Panthers throws Odell Beckham #13 of the New York Giants to the ground at MetLife Stadium on Dec 20. 2015 in East Rutherford, New Jersey. Odell Beckham of the New York Giants mixes it up after a play in the first half against Josh Norman of the Carolina Panthers at MetLife Stadium on Sunday, Dec. 20, 2015 in East Rutherford, New Jersey. 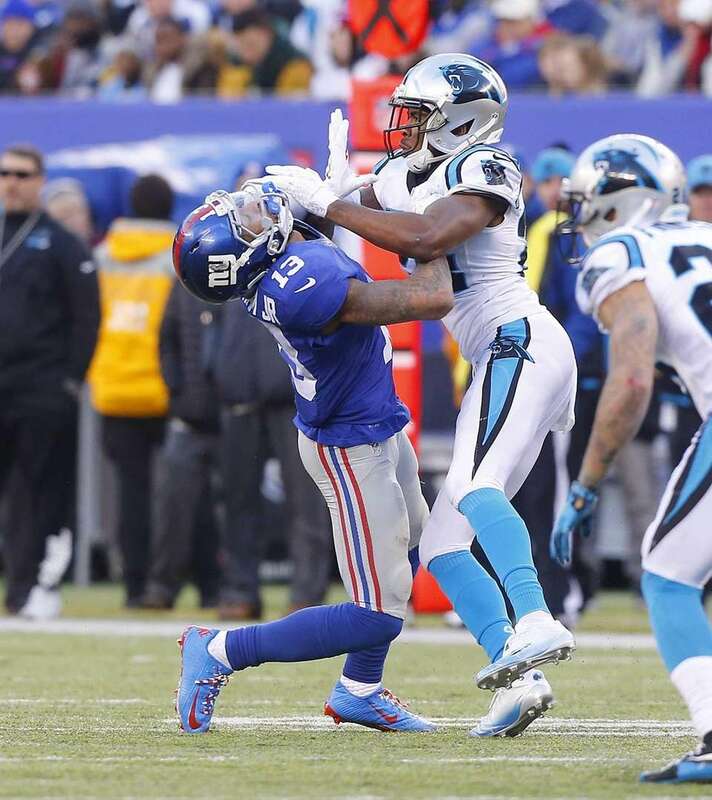 Giants' Odell Beckham Jr. and Panthers' Josh Norman mix it up during first half. 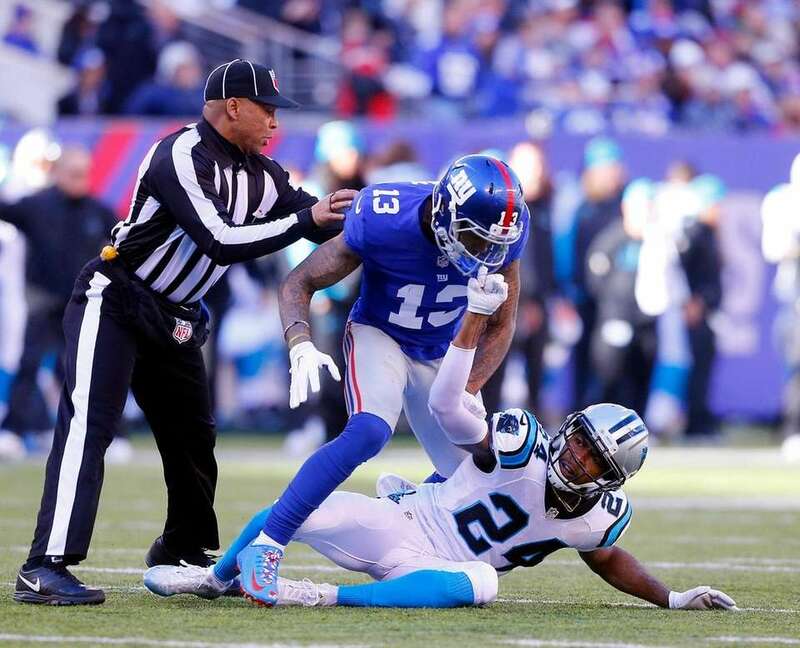 Josh Norman #24 of the Carolina Panthers stands over Odell Beckham #13 of the New York Giants in the first half at MetLife Stadium on Sunday, Dec. 20, 2015 in East Rutherford, N.J.
Josh Norman #24 of the Carolina Panthers mixes it up with Odell Beckham #13 of the New York Giants after a play in the first half at MetLife Stadium on Sunday, Dec. 20, 2015 in East Rutherford, N.J.
Josh Norman #24 of the Carolina Panthers throws Odell Beckham #13 of the New York Giants to the ground at MetLife Stadium on Dec. 20. 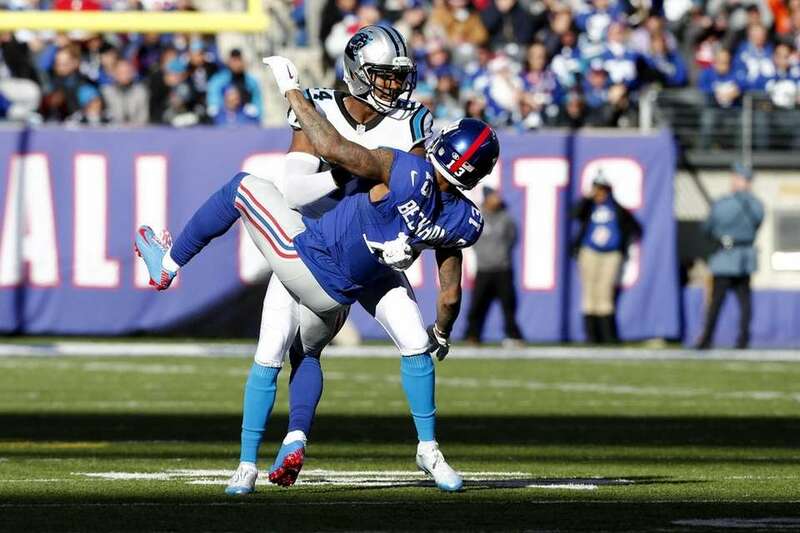 2015 in East Rutherford, N.J.
Odell Beckham #13 of the New York Giants is hit after a snap in the second half by Josh Norman #24 of the Carolina Panthers at MetLife Stadium on Sunday, Dec. 20, 2015 in East Rutherford, New Jersey. Odell Beckham #13 of the New York Giants mixes it up after a play in the first half against Josh Norman #24 of the Carolina Panthers at MetLife Stadium on Sunday, Dec. 20, 2015 in East Rutherford, New Jersey. Odell Beckham #13 of the New York Giants looks for room in the first half against Josh Norman #24 of the Carolina Panthers at MetLife Stadium on Sunday, Dec. 20, 2015 in East Rutherford, New Jersey. 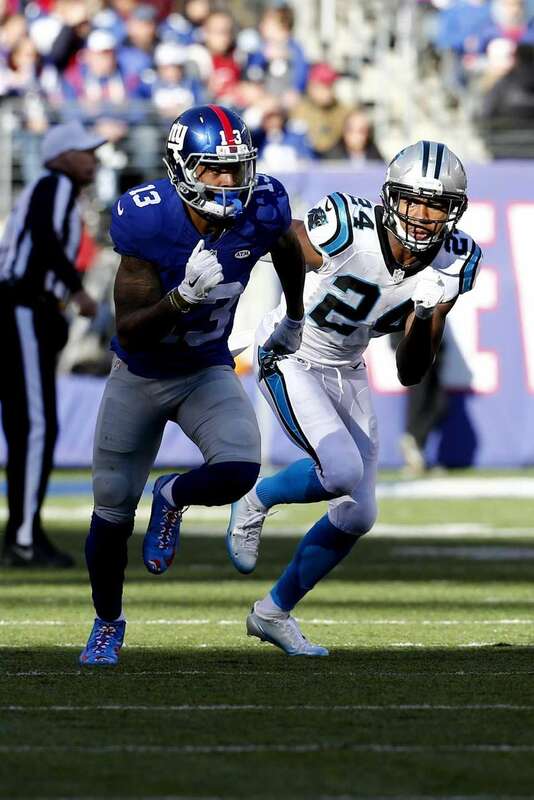 Odell Beckham #13 of the New York Giants is hit after a snap in the second half by Josh Norman #24 of the Carolina Panthers at MetLife Stadium on Sunday, Dec. 20, 2015 in East Rutherford, N.J.
Josh Norman #24 of the Carolina Panthers mixes it up with Odell Beckham #13 of the New York Giants after a play in the first half at MetLife Stadium on Sunday, Dec. 20, 2015 in East Rutherford, New Jersey. 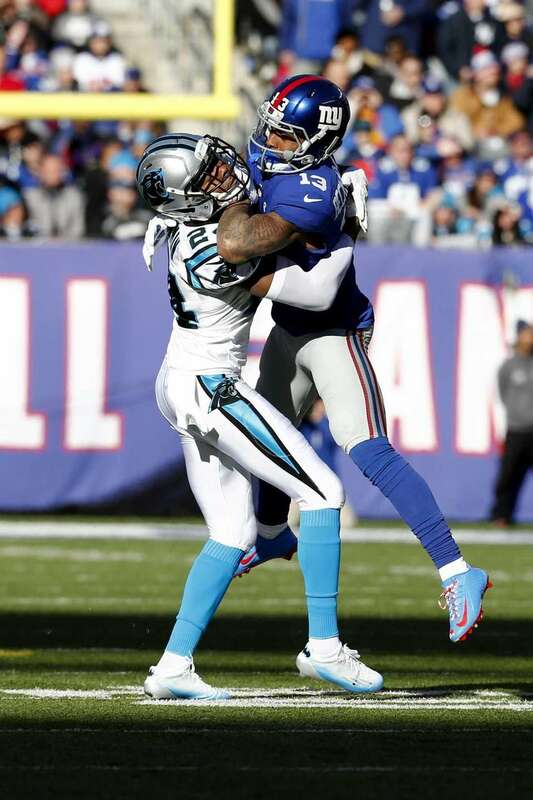 Josh Norman #24 of the Carolina Panthers covers Odell Beckham #13 of the New York Giants at MetLife Stadium on Dec. 20, 2015 in East Rutherford, N.J.